This website is dedicated to the Yohkoh solar observatory satellite, a cooperative mission of Japan, the USA, and the UK. 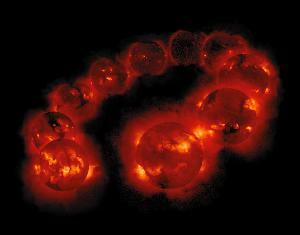 Yohkoh was launched in 1991, and observed the solar atmosphere in X-ray radiation continuously for ten years. Yohkoh Observatory: front page. This introductory page. About Yohkoh. Overviews of the Yohkoh mission, spacecraft, and instrumentation. Operations and Schedules. Observing campaigns, past and future. Current state of SXT and BCS. Personnel schedule. Data, Catalogs, and Requests. Lists of data, forms for requesting, contact information. Results and Publications. Science Nuggets, Greatest Hits, and Publication lists. Image Galleries. Collections of still images, movies, and explanations. Includes high-resolution solar images in TIFF format. Education and Public Outreach. Tours, lesson plans, tutorials. Yohkoh Hot Topics. Research highlights, press releases. Complete table of contents. All the links from all the categories, on one page. Bookmark it! If you do not find the link you are looking for here, or if you have suggestions, please direct your comments/questions to us at the address below. This webpage is not maintained anymore. For the mission-long complete Yohkoh data set, go to the Yohkoh Legacy data Archive.